Welcome to your platform on the business and investment opportunities in Derry and Strabane. We have been helping companies grow and thrive in the Derry City and Strabane District region by supporting Start Up, Growth and Innovative Businesses of all sizes to help fulfil their potential. We work to attract inward investment by promoting Derry City and Strabane District as a region of opportunities. We provide free, bespoke and confidential packages of advice for foreign and domestics companies and potential investors. We also offer aftercare support to recent investors. Our services are available to national and international companies that wish to relocate to, export from or expand within the Derry City & Strabane region. 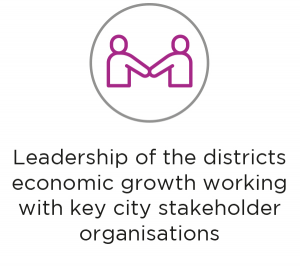 Invest Derry Strabane has a clear focus on promoting to priority growth markets aligned with the Council’s ambitions strategic growth plan, to create more and better jobs through economic growth. Invest Derry City and Strabane are the official business promotion agency for Derry City and Strabane District Council. Our mission is to tell Derry ~ Londonderry City and Strabane District’s story to an international audience. Our purpose is to promote Derry & Strabane internationally as a premier location in which to invest, work, study and visit with the potential to maintain and develop links with those who have a connection with City and District area. Have a look through our site and get in touch!